"I don't know if you've already created a list or other way so that we can be notified whenever a new group is created but I would like to have that." "do NOT "contact by email"...be careful, this looks like a SPAMMER: sheleylo left a comment for Cynthia Cote "how are you dear, i will like to be your friend and also have something to discuss with you, contact me…"
"national postal museum library,smithsonian institution libraries, www.sil.si.edu/imagegalaxy FOUND"
"Mail-Art and Money don't Mix" is what Lon Spiegelman wrote in the 80-ies. Are these views still shared by the current generation of mail-artists? "If someone places an URL to a website that causes spam or is inappropriate. The member normally doesn't get in. Please take a note when you join in of change your URL." "This spammer has been removed. Thanks for alerting me." "Also received same weird message from Alexandria Guerrero." "Got the same message as Jayne did..."
A Group where we can discuss how to deal with SPAMMERS in the Mail-Art. "Hi Ruud (and group members)! See the above screen-captured images. A new member, Alexandria Guerrero, just joined yesterday, and has left a note on my wall. I DID NOT reply to the email that was provided. This person’s profile is…"
"please feel free to make your own membership card....!" "I think "AHUVA" from "Israel" was a spammer and has been deleted. Never reply to emails if you do not recognize the sender!" On May 3th I started this small research project. 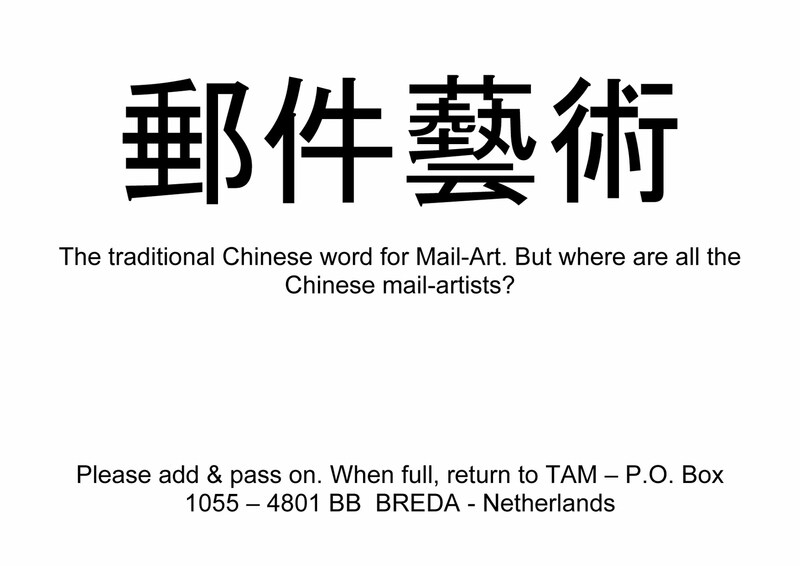 Where are the chinese mail-artists? First I have to ask the question. Als I made add & pass on papers which I will send into the Network. 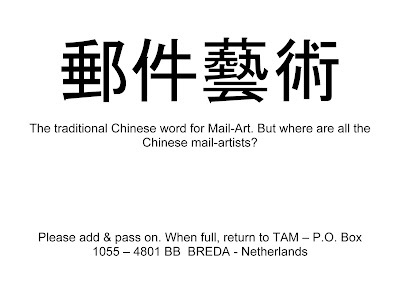 What I hope for is to connect to some Chinese Mail-Artists and integrate them into the global network. Sorry IUOMA-members, A spammer signed in and added comments to members. This Chun Clark was removed and all her content was removed. About 50 messages where she (?) offered ringtones. I don't know if you've already created a list or other way so that we can be notified whenever a new group is created but I would like to have that. That should have read, "2 'paragraphs'", sent in 2 emails. Ruud, what is the etiquette about posting photos of art received from non-IUOMA members. I have received some beautiful art from Emilio Carrasco but unless he goes by a different name I can't find him on the site. Is it OK to post his work anyway? Hanif has been removed because of spamming! Ruud, my friend Ruth Dellinger (an IUOMA member) sent me this email--she's concerned this guy is a scammer and it looks that way to me, too. Sent from RED's iPad, that sometimes makes up words!